PPC Management - Pay Per Click Management | Net Gravity Inc.
IS YOUR PPC CAMPAIGN FINDING TREASURE OR TRASH? A quality PPC campaign doesn't just bring in clicks, it makes sales. The people who click your PPC ad should be motivated to buy your product, and your PPC ad should offer them a product that they want. If it isn't, you're wasting money! IS YOUR PPC CAMPAIGN HEADED IN THE RIGHT DIRECTION? We build PPC campaigns every day that attract only qualified leads who are ready and motivated to buy what you are selling. We can make sure there is never "one that got away!" To put it simply, Pay-Per-Click or PPC marketing is the most powerful marketing tool at a company's disposal available today. PPC Marketing unlike practically all other competing forms of marketing provides you with tangible and measurable results - there are hundreds of statistics that allow you to see how every dollar is spent as well as calculate exactly what your ROI is. As powerful as PPC marketing is however, it is not to be attempted by amateurs as it is also one of the most dangerous marketing tools. In the hands of an amateur, a PPC marketing campaign can waste money as fast as it can make it potentially losing thousands of dollars per hour. With that in mind, we've put together a graph to illustrate what you can typically expect from your PPC marketing campaign - we suggest you pay particular attention to the typical user campaign on "auto pilot" if you're thinking of attempting it yourself! WHAT CAN YOU EXPECT FROM YOUR PPC CAMPAIGN? TYPICAL USER CAMPAIGN ON "AUTO PILOT"
Keywords Very few relevant keywords. Hundreds of keywords, however many might be irrelevant keywords. 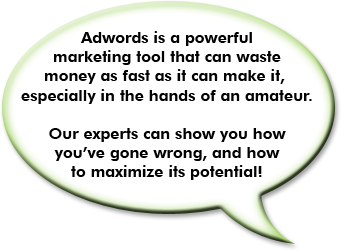 Thousands of laser targeted keyword phrases reflecting specifically what you are offering. Geographically targeted ads that only show up where your target customers are. Geographically targeted ads that only show up where your target customers are. Lost Impression Share No idea why losing impression share Should be able to tell you why you're losing impression share. We can tell you exactly why you're losing impression share. Budget No limits on spending. Limits on spending, but budget is set too high to accommodate wasted keyword spend. Limits on spending to maximize opportunity and minimize waste. Position Preference Blanket position rules. Blanket position rules. Individual position rules, some keywords perform well and others will not and they need to be bid down and potentially eliminated. Delivery Method Staggered budgets throughout the day. Staggered budgets throughout the day. Laser targeted budget to the highest converting times of the day. Ad Delivery Lets Google handle ad delivery ratio, consequently making decisions with incomplete information. Lets Google handle ad delivery ratio, consequently making decisions with incomplete information. Ads are shown evenly. Networks Search network intent is explicit - display network is NOT. Both channels are not being utilized properly. Both channels might be utilized properly. Search Network and Display Network are both utilized properly. Average Position Position 1 or at the very bottom. Position 1 or at the very bottom. Most profitable position, position 1 is often not the profitable "sweet spot." Ad Group Segmentation Large clusters of keywords within each ad group. Large clusters of keywords within each ad group. Highly segmented ad groups with very few keywords per ad group. Ad Copy Poorly thought out and irrelevant ad copy. Generic and mass produced ad copy by poorly paid staff. Well thought out ad copy that resonates with your target market, maximizing click thru rates. Tracking No tracking, no real idea whether campaign is working or not besides looking at sales figures for the month. Conversions are tracked. Conversion is closely tracked and steps are taken to ensure conversion rate is high. We're obsessive about conversion! Landing Pages Is your traffic being sent to a poor landing page? The best PPC campaign in the world will fail if the website traffic is going to is terrible! Will send the traffic to whatever website you might have, even if the website is unlikely to convert. We will ensure your landing page is professional so that your PPC campaign has the best chance to convert visitors into customers! Bidding Strategy Bids not being adjusted on a regular basis. Bids are rarely adjusted (if at all) Bids are constantly adjusted based on past and predicted performance.